"We fight a war against false hope, Crota. We chase a god called the Traveler, a huckster god who baits young life into building houses for it. These houses are unsafe, for they cannot stand against my Hive. And these houses are a trap — for they lead young life away from the blade and the tooth, which are the tools of survival and the means of ascension. [...] Thus I name you Crota, Eater of Hope." Crota, Son of Oryx, also known as the "God-Knight" and the "Hope-Eater", is an ancient and powerful Hive Prince who infamously wielded the Sword of Crota and killed countless Guardians during the City's ill-fated campaign to reclaim the Moon. Crota is the main antagonist in The Dark Below, in which the Hive seek to awaken him to lead their armies against humanity. 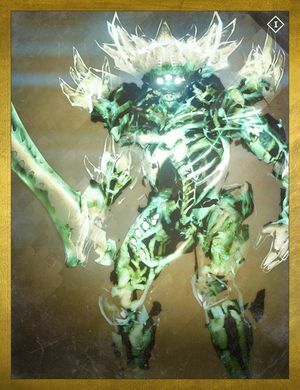 Crota is one of the many gods worshiped by the Hive. Though he is the "youngest" member of the pantheon, he is noted to be the heir to the Osmium Throne, the absolute sovereignty of the Hive. His purpose is to conquer Earth on behalf of his father, Oryx, the ruler of the Hive. Crota has a sect devoted to him, who are spawned under his consort Omnigul, Will of Crota; though he himself belongs to the Blood of Oryx sect. Long before the Hive stalked the Moon, Oryx raised Crota to be his champion the "Eater of Hope", traveling to many distant worlds and devouring them on his behalf and chasing after the Traveler. In time he gained reputation as a terrible demon. Once while he and his sisters were experimenting in the Ascendant realm, he accidentally let the Vex into his realm, as part of a trick by his aunt Savathûn. As he failed to eliminate them, the Vex created Quria, Blade Transform in order to deduce the Hive's Sword Logic and defeat the Hive while attempting to become gods themselves. The invasion forced Oryx's hand; as he dealt with the Vex, he threw Crota through the Vex warp gate as punishment, declaring "Come home glorious, or die forgotten!" As he went out conquering through time, he established many monuments and temples to his father, while feeding him tribute in the form of captured Light. At some point Crota and his spawn pursued the Traveler into the Sol System and colonized the Moon, where they laid in wait until they launched an invasion of Earth. The Guardians first encountered the Hive at the Battle of Burning Lake; not realizing the true threat the Hive posed, they launched a counterattack on the moon, which was later called the Great Disaster. The Sword-Logic proved to be too much for the Guardians, as countless heroes fell; in particular, the legendary Titan Wei Ning was slain personally by Crota. Out of revenge, Eriana-3 led five other Guardians in an attempt to kill Crota, but Crota's soul managed to evade permanent death by escaping to the Ascendant realm. Only one of the Guardians, Eris Morn, survived to tell the tale. His sect, led by Omnigul, later attempted to revive his corporeal form to lead a full-scale Hive invasion upon the City, only for their efforts thwarted by the Guardian who, with aid from the vengeful Eris Morn, would kill Omnigul and decimate the remainder of his court. Crota, however, survived until another fireteam of Guardians confronted him at the Oversoul Throne in his throne world, entered from the depths of the Hellmouth; where he finally met his permanent end. Crota's demise ultimately caught the attention of his father, Oryx, hive god of black magic. Enraged by the death of his son, Oryx would bring his Dreadnaught into the Solar system and lead an army of Hive and Taken in revenge against the Guardians. Ironically, Crota's lingering Ascendant power was necessary for the Guardians to access the rupture gateway into Oryx's sanctum. Returning to the Chamber of Night that tended to the crystal that house Crota's soul, the Guardians were able to gain a shard of the crystal but it did not hold of piece of his soul. The Guardians now had to disrupt Crota's death ceremony to gain a sliver of his soul. Entering Crota's Fortress, the Guardians narrowly slipped past the Hive defending his tomb and were able to fill the shard with Crota's death essence. With the Ascendant Shard, the Guardians were successfully able to enter Oryx's throne and defeat him. Like father, like son; Oryx would later fall to the Guardians who killed Crota in the King's Fall Raid. Crota's disowned, heretical and forgotten brother, Nokris, would make his own stand against the Guardians after arising from slumber in the icy depths of Mars' Hellas Basin with his master, the Worm God Xol, Will of the Thousands. The herald of Xol sought to conquer the red planet for his god but like his former family, Nokris would fall against the Warrior of Light. Crota is only mentioned in the base game and is never fought, but players are tasked with finding and destroying the Sword of Crota. The players are tasked with destroying a crystal housing Crota's soul in The Wakening, before the Wakers of Crota can revive his corporeal form. It fires powerful blasts at the player and is protected by many Hive, including four Wakers of Crota. Crota himself appears as the final boss of the Crota's End Raid. He will spawn after all players stand near his summoning crystal. Once he enters the arena, all Guardians will be inflicted with a debuff called Presence of Crota, which disables regeneration of both health and shield alike. To counteract this, one can pick up the Chalice of Light that spawns in the middle of the room; it can be picked up by anyone that needs to regenerate. Crota will not be vulnerable to attack at the moment, as he will be protected by a resistant shield. This gives Crota the opportunity to pelt Guardians with Darkness Blasts from afar, similar to Wizards. Meanwhile, a Swordbearer will show up at the bottom level. It must be killed in order to pick up its Ascendant Sword, which is the only way to actually damage Crota. In order to make him vulnerable to attack, all other players must focus all their available firepower on Crota's shield to disable it. The player carrying the sword must rush in quickly, as the shield can regenerate in less than a second. Nothing else will be able to damage him at this time. Once his shield goes back up, everyone else should be ready to shoot it down again so that the sword carrier can get in as much damage as possible. It will take multiple sword runs to bring Crota down. After Crota recovers, he will summon his Oversoul. If not shot down, it will instantly kill the entire team. Age of Triumph added a Challenge Mode for Crota. To complete it, nobody can hold the sword more than once. Even if a player drops it, if they pick it up again, the challenge will fail. It is mentioned in The Taken King that only Ascendant Hive could enter the Ascendant plane, those Hive which had killed enough to gain admittance. This meant that the means of how the Guardians accessed the Oversoul Throne on the Moon are unknown, as they did not follow the philosophy of the killing logic. A logical explanation is that Crota bled his Throne over into the Moon, becoming one and the same with the planetoid, meaning the same mechanics which allowed Guardians free roam on the Dreadnaught enabled them to enter Crota's realm, through the simple act of killing. The reason for Ascendance is because Guardians had not been killing long on the Dreadnaught, meaning it was necessary to steal Crota's soul. Crota is the first Hive and main antagonist to speak in English in-game, as his demonic whispers can be heard during the Dark Below mission, The Wakening. His father, Oryx, being the second, and Ecthar being the third. Said whispers heard include: "Closer" and "I can't die". The name "Crota" is also an uncommon surname in the USA. Crota is the first Hive deity to appear in-game. Crota's soul housed within a crystal. Crota's soul rising to attack the player after the Wakers of Crota were destroyed in the mission The Wakening. A farther away shot of Crota's Soul.